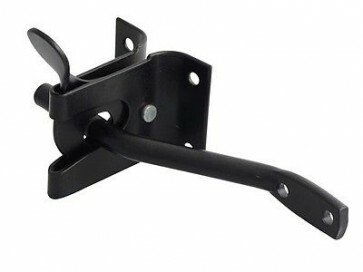 This Forge Auto Gate Latch will automatically latch when the gate is pulled to the closed position. Ideal for gates in fields where easy access is preferred over security. Also used widely for garden gates. Supplied with all fixings and fitting instructions. Fitting Instructions: 1. Position the keep on the fence post and mark the fixing holes with a pencil. Drill pilot holes with a Ø2mm drillbit and fasten in place using screws provided. 2. with the gate closed, position the latch arm so that it is engaged in the lock and screw into position using the fixings supplied.